Our Rear Shock Extensions eliminate interference between the shock absorber and axle housing – a problem that commonly occurs on Wrangler TJ models when a CV-type driveshaft is installed. This is achieved by relocating the lower rear shock mounts away from the axle housing. The additional clearance provides plenty of room for the shock absorbers to be installed without any interference. The Rear Shock Extensions are just as effective on applications with extreme suspension travel, where the axle housing rotates in response to excessive droop. 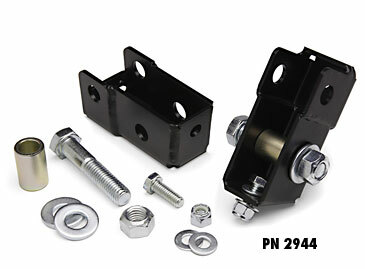 Installation is simple and no welding is required, as our bolt-on extensions fit securely on the factory shock mounts. Anti-corrosive mounting hardware is provided, and a durable powdercoat finish is applied for long lasting protection.